If you have water in your basement, it is important to have a professional install a waterproofing system to keep your basement dry. The professionals at Iowa Home Restoration & Repair, LLC has the products and solutions to keep water out of your basement. Cracks in basement floor – The soil under your foundation may not adequately absorb groundwater. This will create hydrostatic pressure and push the water through any cracks that are in your basement floor. Excess moisture inside walls – Moisture buildup can cause condensation. This buildup can seep into your basement and cause mold and structural damage. Cracks in walls and mortar joints – Too much moisture in the soil leads to hydrostatic pressure, creating wall cracks which can cause the water to enter your basement. Over the footer – Water can enter through cracks between the footer and adjoining wall. Under the footer – There may be small gaps between the footer and basement floor where excess water can penetrate the cracks. Let the experts at Iowa Home Restoration and Repair inspect your home and offer you the basement waterproofing system to keep your basement dry. Part of our waterproofing system includes the installation of a sump pit. A sump pit, also known as a sump basin is part of the solution for basement waterproofing. The sump pit accompanied by a sump pump, is very productive in keeping water out of your basement. A sump pit will collect the water and when it reaches a certain level, the sump pump will turn on and remove the water from the sump pit and discharge it away from the home. Iowa Home Restoration & Repair, LLC uses only the best sump pits on the market today. 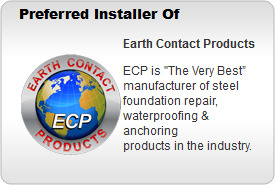 They are manufactured by Earth Contact Products (ECP), the very best waterproofing products in the industry. The sump pit is installed in the lowest part of the basement. ECP sump pits are efficient, safe, and innovative. 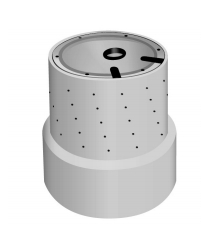 It’s bell shape allows for more water to be collected and lessens the number of times the pump needs to operate. A strong polyethylene is used to form the sump pit. These sump pits have a lot of strength, so they will last for many years to come. A clear lid allows you to see inside the pit without taking it apart. You can be assured that everything is working properly with just a glance. The sump pit will reduce the moisture in the soils surrounding your home, making it harder for water to enter your basement. The humidity inside your home will decrease, saving you money on energy bills. Let the professionals at Iowa Home Restoration & Repair, LLC install a sump pit in your Iowa home to keep your basement dry and give you peace of mind. We have established an outstanding reputation and we intend to keep it that way. Contact us today!